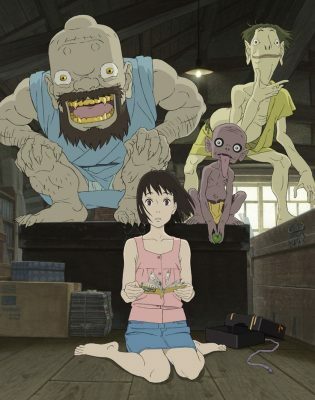 A heartwarming animated fantasy from Jin-Roh: The Wolf Brigade director Hiroyuki Okiura that was seven years in the making. With the assistance of key animation supervisor Ando Masashi (Spirited Away), Okiura presents a richly expressive depiction of the beautiful scenery of Japan’s Seto Inland Sea region. Winner of the New York International Children’s Film Festival’s Best Feature Film Grand Prize. An 11-year-old girl named Momo (voice: Miyama Karen) moves to a tiny island in the Seto Inland Sea. She continues to cling to the memory of her late father who left her an unfinished letter, and finds herself unable to adjust to her new lifestyle or make friends. Then one day, she is visited by three bizarre creatures.